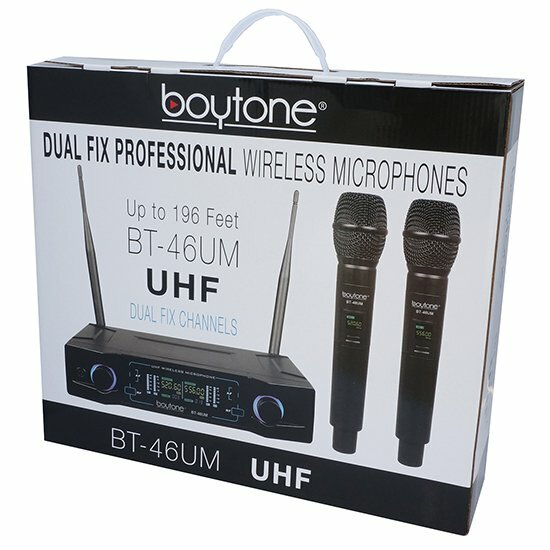 Boytone BT-46UM with 2 wireless Digital microphone system by Boytone has dual UHF fixed frequency channel and broad audio response range with low distortion so you can enjoy cordless singing to karaoke music and mobility for energetic on stage performance, Microphones provide up to 15 hours of wireless operation on a 4 AA alkaline battery included. Each microphone operates on a single separate channel in the high-band UHF range for reliable, This professional portable wireless microphone set has a channel frequency range of 470~680MHz and 614~675 MHz high signal over noise ratio performance for capturing high quality audio. Ideal for professional engagement, conference. Each dynamic mic features its own Mute, off & on power for a karaoke experience that both kids and adults will enjoy. Perfect for PA, karaoke, Dj party, conference. 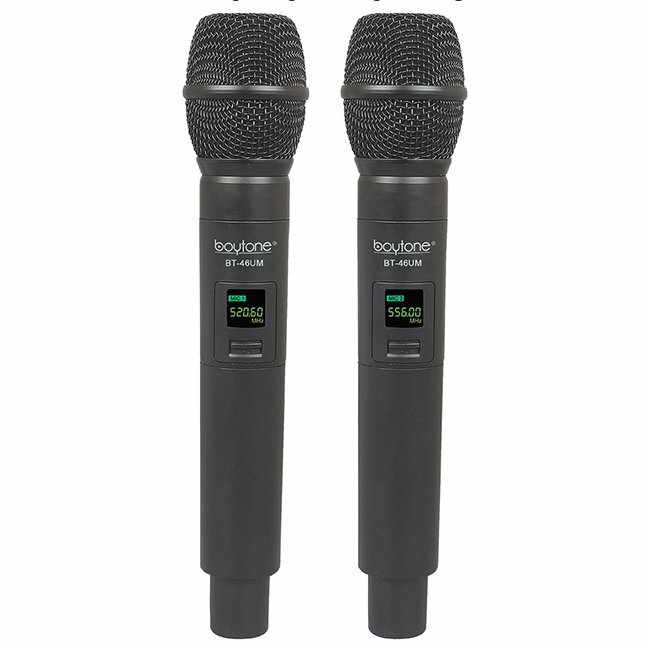 Each microphone operates on a single separate channel in the high-band UHF range for reliable, interference-free performance, and excellent high-fidelity audio. 196+ ft. typical operating range — up to 300+ ft. line-of-sight Both the receiver and the mic has a power ON / OFF switch and the receiver has LED status signal indicator light and dual independent antenna. Plug your unit into your mixer, amplifier, or speaker with a 1/4" mono cable, AC Adaptor 110 to 240 volt with the Aluminum caring case, the package includes a receiver and 2 wireless handheld dynamic transmitter mic. 4 x AA battery. The device can be used outdoor and indoor like a school classroom, church or at home for personal use. 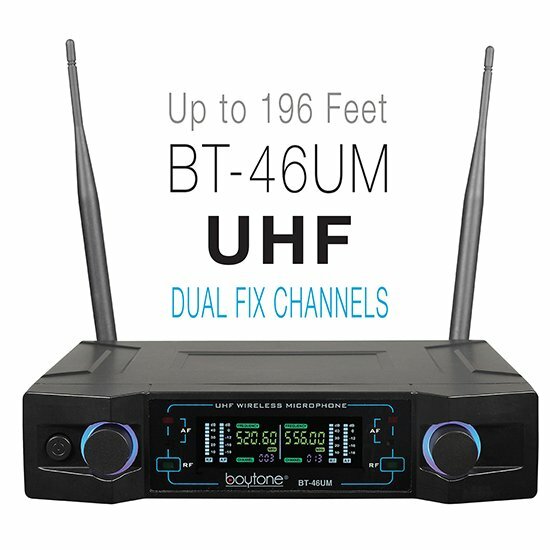 One year warranty from Boytone. 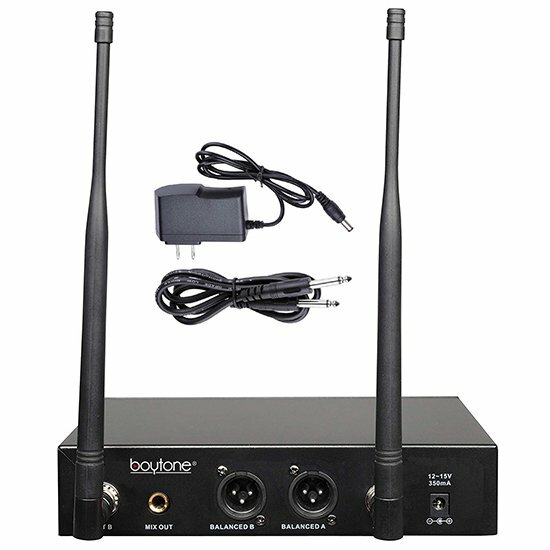 DUAL FREQUENCY CHANNEL: 2 wireless Digital microphone system by Boytone has dual UHF fixed frequency channel and broad audio response range with low distortion so you can enjoy cordless singing to karaoke music and mobility for energetic on stage performance, Microphones provide up to 15 hours of wireless operation on a 4 AA alkaline battery included. 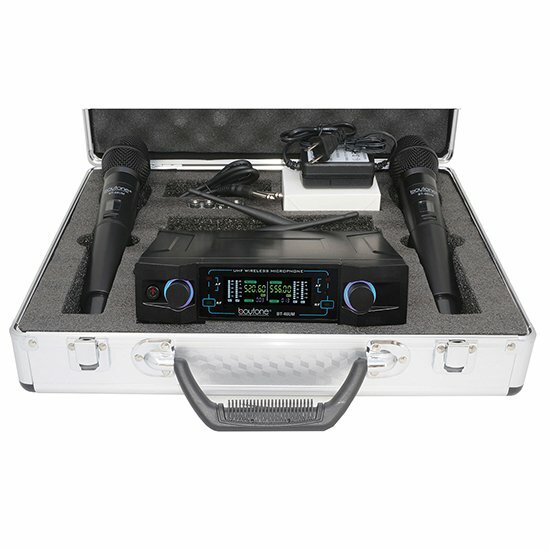 WHAT\'S IN THE BOX: with the Aluminum caring case, the package includes a receiver and 2 wireless handheld dynamic transmitter mic. 4 x AA battery. The device can be used outdoor and indoor like a school classroom, church or at home for personal use. 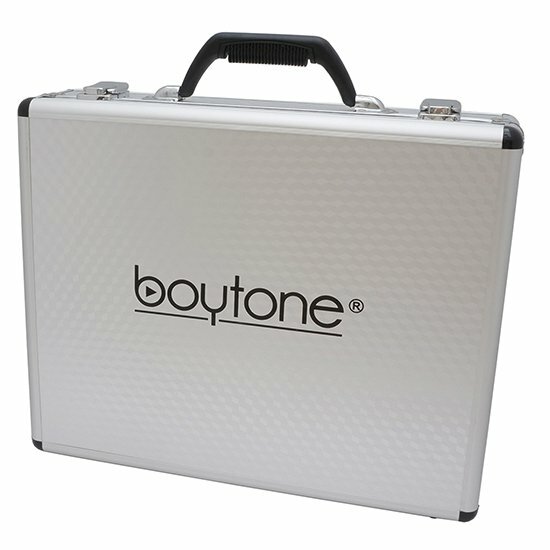 One year warranty from Boytone.